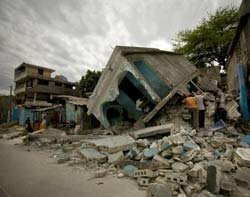 Telecoms San Frontieres (TSF) has sent an emergency team to Haiti to set up emergency telecoms equipment and provide support to aid workers. The organisation is taking satellite mobile and fixed telecoms tools from the US base in Managua, and reinforcements will be sent from its international headquarters. The charity said there is currently next to no infrastructure near capital Port au Prince and contact cannot be made with the airport. The team will fly to Saint-Domingue and travel to the capital, where the 7.0 magnitude earthquake struck. Communications equipment is vital during the aftermath of a natural disaster, allowing NGOs, the UN and local authorities to communicate. It allows aid efforts to be co-ordianated and can provide civilians with a link to the outside world. This is the fifth trip to Haiti for TSF, with the country having suffered a range of natural disasters in recent years, including several hurricanes. They will be joined in the country by the International Telecommunications Union, a UN agency, which announced yesterday it would send $1m worth of equipment and expertise.